I recycled a skittles candy box(cylindrical) to a pencils holder. Made this holder to hold CJ's frequently used markers, pencils and pen. It needed an extra compartment to store CJ's scissors and magnifier. She misplaces them often. So I added a small pocket to the outer surface. Place the cylindrical box on the fabric and lightly trace the shape of the box with a pencil/pen. Cut the fabric approximately 1/2 inch bigger then the marked lines. For the fabric I used a shirt hand from CJ's shirt. 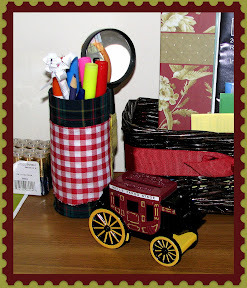 Paint the entire outside of the cylindrical can with glue/modpodge and spread the fabric over and flatten it out. Use glue to seal the seam/overlap fabric. Onto the inner opening surface of the can, fold the remaining fabric and glue it. Do the same for the bottom. Cut a rectangular piece of fabric and cover the remaining part of the bottom circle. I added a small piece of red fabric to spruce it up. Cut a pocket from an old shirt and glue it to the outer surface of the holder. An extra compartment to store a small notepad or scissors. How do you put the stamp edges to photos? Thanks Roopa! I use picnik Software to edit my photos. Have you tried picnik software? It's fun to work with the software!